Joe Weissinger with his wife, Bridget, 4-year-old son Joey, and newborn baby girl Aubrie. His dialyzer is pictured on the left. 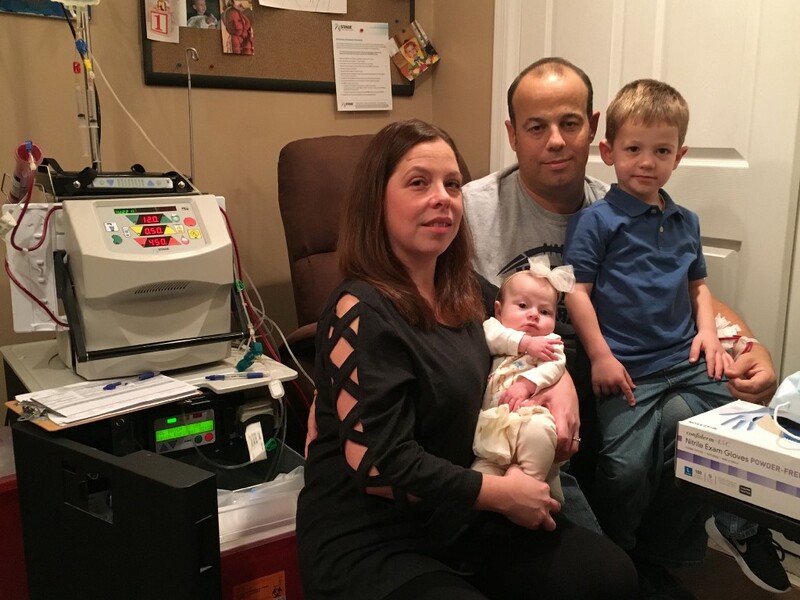 While sitting next to his dialyzer — a machine about the size of a mini-fridge that essentially functions as a human kidney — in his bedroom of his South Philly home, Weissinger, careful and focused, withdraws blood from his left arm. The blood goes through a tube and into the dialyzer, where it gets filtered and mixed with a solution. The machine retains the “bad stuff” in Weissenger’s blood, and sends the “good stuff” back through another tube, which is plugged into the same fistula on Weissinger’s left arm. The dialyzer hums like a loud space heater. You tune it out. One of the effects of Weissinger’s rare kidney disease, called Membranous Nephropathy, is that his body retains too much water. The dialyzer removes the excess liquid. On the day we meet, Weissinger weighed himself and determined that his body had about a liter more water than it should, so he set the machine to remove just that much. Weissinger, who is 42, has been performing kidney dialysis by himself since 2014, and he’s become comfortable with the process. Or at least as comfortable with it as somebody who performs self-dialysis could possibly be. It’s a tedious process that Weissinger, who is the assistant to the JV coach for South Philly’s Warriors football team, does five days a week. Each session takes about five hours. Weissinger was employed as an insurance appraiser. For about a year and a half starting in June 2014, he worked full-time as an appraiser and performed dialysis on himself five days a week. But that eventually proved to be too much to handle, and he was forced to leave his job at the end of 2015. Right now, his volunteer coaching work with the Warriors is one of the main things that gets him out of the house. None of the kids on the Warriors football team are related to Weissinger. He just wants to help. There’s only one thing standing between Weissenger and living a normal, dialysis-free life: a kidney transplant. He’s been privately seeking one ever since he learned of the disease, but so far to no avail. About a month or two ago, Weissinger decided to go public. He started a Facebook page and a website, kidney4joe.com, in an effort to get the word out. Weissinger’s bloodtype is O+, which means he can accept a kidney from anybody whose bloodtype is either also O+ or O-. If you’re interested in donating a kidney to Joe, or know somebody who might be interested, reach out to Thomas Jefferson Hospital at either (215) 503–4000 or (888) 855–6649, and explain that you’re interested in donating a kidney to Joe Weissinger.